Dies R Us: Two for One! Happy Dies R Us Thursday everyone! Robin here with my design of the week! Valentine's Day is one of my favorite days to give cards so I hope I'm not overdoing this "heart" thing but I can't stop myself! My card base for both cards is an A2 ( 4 1/4 x 5 1/2) top fold card. Since I wanted a red and white card I cut each image twice, once from red and then from white card stock. The dies I used are both from Tailored Expressions, Postage Stamp Stacklets and Love Tree. The cute postage stamp die has stitching around the edge...love this! I used spray adhesive to attach the trees to the postage stamp, added ribbon to the bottom, then added foam tape to the back and added to my card bases. 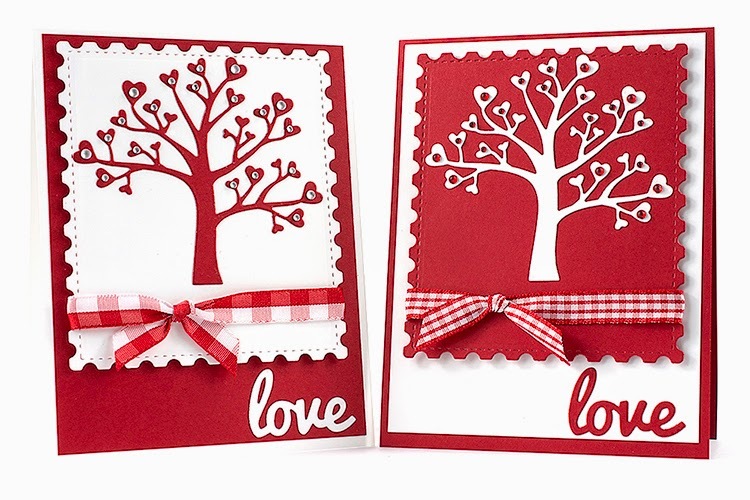 The love die cut was added to the bottom with liquid glue and the card was finished with smooth rhinestones on the tree. Be sure to stop by Dies R Us and see all the new products! This IS your one stop for everything dies! As always, shipping is FREE on orders $35 to more!